Dealing with Decisions? Mid-marriage is defined by too many options. You could do this… or that. Or another. And another thing. Analysis paralysis sets in and nothing happens. Nothing. You’re stuck in limbo as a couple because you can’t decide. Proactive or Reactive? Or some combination of the two? In a proactive & reactive combination, they’re usually on the path of the more proactive person – where the reactive person doesn’t feel heard because they’re slower to react/make up their mind, and the proactive person is wondering why as a couple they’re always doing what she/he wants! The relationship between two proactive people might have a lot of “head-butting” – both husband and wife are taking action and they’re wondering why they’re never on the same page… and they’re saying to others, “we’ve grown apart” because they’re busy doing their own thing. 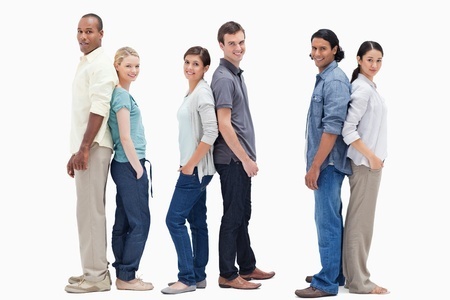 How can all these types of couples make a decision? The Values you and your spouse choose will be very different than ours! 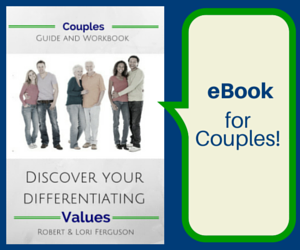 If you’re interested in determining your own differentiating Values as a couple, we’ve developed a workbook/guide. 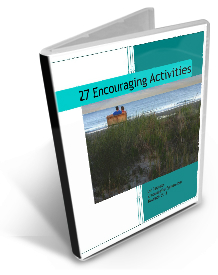 And we’re in the process of creating videos to accompany you through the workbook. But there’s something every couple needs when dealing with decisions. Specifically the serious decisions. What is it? The ability to pray together. Prayer is necessary when dealing with decisions. Even with knowing your own differentiating Values as a couple, diligently praying and asking for direction from your Heavenly Father must be a part of the equation. As humans we don’t know all the details – only God has the big picture view. He’ll lead and guide us if we ask. And if we seek. When we knock and keep knocking to understand and know what He wants in our lives, then the decisions become clear. What if you’ve never prayed together? Or it’s been a while? We have some suggestions for you HERE. Just a note: Prayer isn’t a magic solution to get what you want, and neither is God a genie in a bottle. The act of prayer renews your faith. The answers you recieve will shape your perspective. It’s a process that’s simple but not necessarily easy. However, it is necessary. Pray. Together. Make a decision. Together. Then go for it. It doesn’t matter whether you’re naturally proactive or reactive. Embrace the opportunity to make a decision together and then go all in. 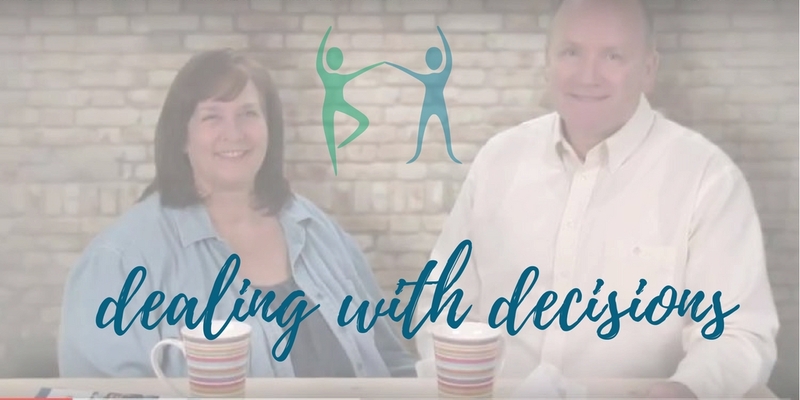 Toss #mid-marriage analysis paralysis out – use prayer and Values to make a decision. Which combination are you and your spouse? Who is reactive and who is proactive? Who innitiates prayer in your relationship? Prayer is not a passive tool, you know! Is now the best time to set goals in your marriage? As a husband and wife, what’s your life like, right now? Sometimes it’s slow and easy, calm and serene with not a ripple in sight. You can manage everything without any extra effort. 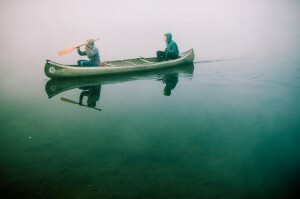 As a husband and wife, you’re floating along – careful not to capsize, but enjoying the ride. Your relationship is not exactly exciting or fresh, but you’re content. Sometimes it’s choppy and wavy. There’s hardly a moment to catch your breath, and life feels like it’s spilling all over everywhere and making a mess. As a husband and wife, you’re managing the curves and dips, sometimes it’s fun, but it’s a fast ride and not for the faint of heart. You’re hanging on for dear-life -your relationship is almost an after-thought, because staying afloat is the name of the game. Sometimes it’s frozen – for a time. Chilly. Icy. Sluggish. 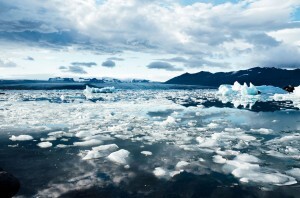 Life has almost come to a stop, bumping up against chunks of ice. As a husband and wife, you’re maneuvering past sharp perils, even as you’re doing everything in your power to keep your relationship warm. You’re on edge – just waiting to hit “the big one”. When is it a good time to talk about setting goals? Surely it’s a bad time to set goals when you’re worried about hitting a life-altering ice-berg in a frozen sea of obstacles? And it can’t be a good time to set any goals when life is racing forward, and you’re being drenched with all the unexpected waves of activity. You wouldn’t want to upset the quiet and peaceful times when life is just floating calmly along, would you? 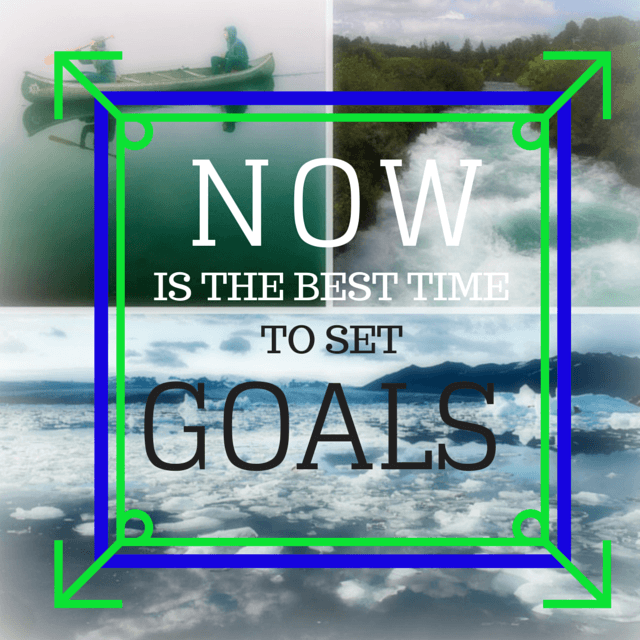 When is it the perfect time to set goals? Now is a good time to set goals. At the very least, setting a goal will focus on making one thing better in your life. 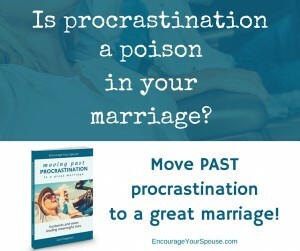 How can you encourage your spouse – or your spouse encourage you – if you you’re just drifting along? Reaching to achieve goals, is the perfect way to be encouraged – and encourage! And yes. You can, and should, set goals at every time in life. 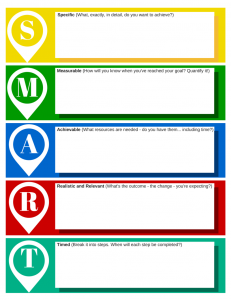 There’s a good chance you’ve heard of the acronym SMART… It’s a prevalent method of goal setting, with each letter representing criteria to set an objective. It’s a good place to begin any goal – large or small, complex or simple. Sometimes a worksheet helps – click*** HERE *** to download a PDF of the worksheet below! Connect with your spouse, and try using the PDF worksheet -( or just a piece of paper with the letters S-M-A-R-T )- and set a small goal. Really small. Then follow through! Use each other’s strengths to make your goal a reality. There’s great power in setting and achieving goals together, as a husband and wife! Wunderlist is a free, easy-to-use task management tool. Create goals and to-dos in areas of your daily life, and assign them to lists of your making/choosing. The lists can be shared with your spouse! Wunderlist works on Windows PCs, Mac OS X, iOS devices (such as iPhone, iPod Touch and iPad), on Android Phones and Tablets, and they sync so you have the latest version on whichever device you use. There is also a web based version, available at: www.wunderlist.com. I’ve been using this digital list/goal device for a number of weeks to organize and stay current on my “work” goals. It’s very logical and provides a thrill when you “check-mark” your done items! I listen to the Cerrone Show as a podcast. On one episode they talked about a method to get control of all the areas of your life, by using an inexpensive three-ring book in a brain dump. The concept intrigued me, because I have quite a few different areas in my life where I contribute (here at EYS, on our travel blog, for client work, for Robert, as a content contributor at YourLocalStudio, and others) It always felt like I was falling behind everywhere because I was trying to keep stuff in my head! 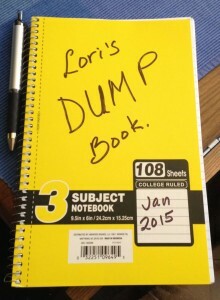 By following their instructions on the podcast – you can listen to it here – I created my own DumpBook to get organized. It’s helped me so much so, that it was possible to create that PDF with Robert about 29 Reminiscing and Reflecting questions. 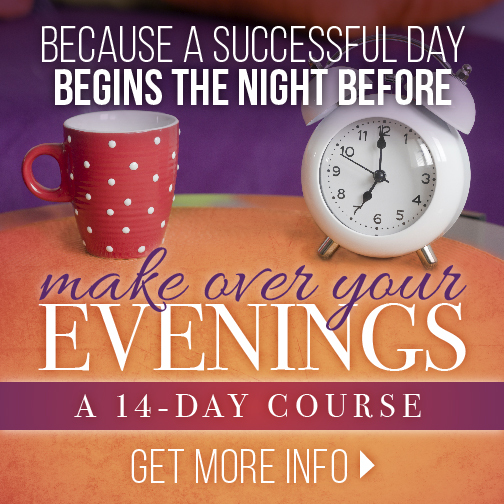 This free APP (yes, there’s a paid online version – but you can download and use portions of the program for free with the app on your iPhone & iPad) is a tool created by Yuval Goren, using Brian Tracy’s material. It’s a traditional goal-setting program for your mobile devices, which asks questions to help plan life goals. I haven’t been using this as heavily as I thought I would, but it was a fun to explore and the questions really got me thinking. The paid website is here – but download the app for the free version. This is an awesome book. It covers all the aspects of goal setting, within the framework of a “relationship retreat” and it’s for husbands and wives… by a husband and wife team. If you subscribe to “Kindle Unlimited” on Amazon, you can download it for free. – click on the picture. Win a signed copy of this book by leaving a comment below! On February 28th I’ll be entering all the names of those who left a comment in these series of posts into Random.org – and choosing a winner! You can enter more than once by leaving a comment on each post! What goals are you encouraging your spouse toward? Does your spouse know your goals? How can s/he encourage you if you haven’t told him/her? Even before a man and woman get married, they begin to set goals. Where will they live? What places will they visit together? How many kids will they have? How can they make a meaningful contribution to their community? Setting goals begins with lots of discussion, dreaming, researching, and more discussion. Then real life gets in the way. For most couples, marriage tends to get complicated; it’s dynamic, ever changing and evolving. Over time, individual preferences and dreams can change. But the desire to set goals doesn’t go away. Goal setting in marriage requires many conversations and adjustments. This is further complicated by the various stages of life and seasons of marriage. Most marriages live through the following stages of life. Newly married – eager to do things together, planning a future and building a life together. Enjoying Life! Married with young kids – experiencing the many joys and challenges that come with having children. Learning to be responsible. Married with older kids – feeling the frustrations and hope that comes with teenagers and young adults. Requires patience, persistence, and continual encouragement. Empty nesters – experiencing a renewed joy on life that comes with new-found freedom. Setting a new vision and learning to work together (again), just the two of you. Grandparents – experiencing the many joys and concerns that come with having grandchildren. Creating a legacy. Sunset – witnessing the joys and pain that comes with the closing chapters of life. Leaving a legacy, while bringing closure. In addition to the stages of life, married couples also live through various seasons. Author Dr. Gary Chapman outlines a wonderful 4-stage model of marriage in his book The Four Seasons of Marriage. These seasons occur over and over throughout the lifetime of a marriage, even as couples live through the various stages of life. Spring – where most marriages begin. There’s excitement and anticipation of good things to come. Even though a marriage doesn’t remain in spring, it is possible to come back to optimism, enthusiasm, and the joy of spring over and over again. Summer – where life is fun and beautiful. Everything may not be perfect, but there’s a feeling of happiness, satisfaction, accomplishment, and connection. It’s a time to reap the benefits of the hard efforts to understand each other and to work together as a team to fulfill the dreams of spring. Fall – where the marriage might look fine on the outside, but inside the marriage is changing. When the chilling winds begin to blow, the deterioration of the marriage becomes evident, just as leaves on trees turn color and fall away. Winter – where coldness, harshness, and bitterness prevails. Often, it’s “rigidity” that brings a couple to the winter season. 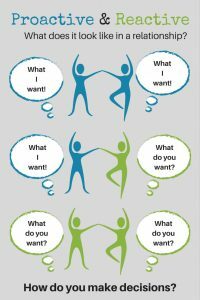 It’s the unwillingness to consider the other person’s perspective and to work towards a meaningful compromise. When considering the various seasons of marriage, the good news is that every couple experiencing fall or winter can return to spring and summer. It’s a deliberate choice and one where goal setting can play an important role. Effective goal setting is more about your attitude than the process. No matter what stage of life or season of marriage you find yourself in, the following will help you choose better goals for this time in life. A great quote from Tony Robbins is “Successful people ask better questions, and as a result, they get better answers.” T his also applies to marriage. So instead of asking your spouse basic questions such as “where do you want to go for vacation?” or “what kind of house should we look for”, try asking deeper questions that probe how your spouse thinks and feels about the topic. If we could improve the life of just one person, who would you choose, and why? What would you list as the #1 most fun thing we’ve done together so far, and why? 2) Change your view of failure. While you might hope that your shared goals would come into being exactly as planned, rarely does that occur. Most goals are achieved in some altered form. And sometimes they fail to materialize at all. The key to a happy marriage is changing your view of failure. Life happens. Lots of unpredictable things can crop up that impact your decisions and plans. When this happens, you have a choice. You can dwell on the failure OR change your view of it. What can you and your spouse learn from this? What would you do differently next time? Who else might benefit from your learning? With this approach, you might even adopt the idea of experimenting with goal setting with the express purpose of learning something new vs. achieving it. 3) Leverage your past and celebrate key milestones. You know you are making progress towards a specific goal if you track it. We do this on a long journey (e.g. miles travelled or important land marks). We measure scores and wins in sports. And while measuring years married is important, there is so much more. How many trips have you planned and made together? How many people have you served together? How many projects (e.g. repairs or remodeling of your home) have you worked on together? Use your past to help your present. If you’re experiencing a challenging issue right now, how did you resolve major issues on previous ventures? And along the journey to achieving a goal, don’t forget to celebrate accomplishments and milestones. They are signs of success and building blocks to setting new and even better goals. Observing the behavior and pursuits of others can provide useful insight and stimulate creative ideas in your own goal setting. You might see how a husband and wife team effectively handles difficult children; yet they might be poor money managers. Or you might see a couple making a meaningful contribution in their community; yet communicate poorly with each other. So unbundle your observations. Discuss the useful insights with your spouse, and avoid replicating the problem areas. Using this method, you might be surprised at what you can glean from even the most challenged marriages. 5) Prepare for the unknown. A successful and healthy marriage includes facing new and unknown challenges. We all experience them. The benefit of a strong marriage is having someone you know and trust to tackle these challenges together. If teamwork makes the dream work, then a married couple united in purpose and filled with passion can overcome just about any obstacle and achieve just about any goal. Learning to be flexible and adaptive, while remaining focused on your goals together, sets the stage to handle any unknown. 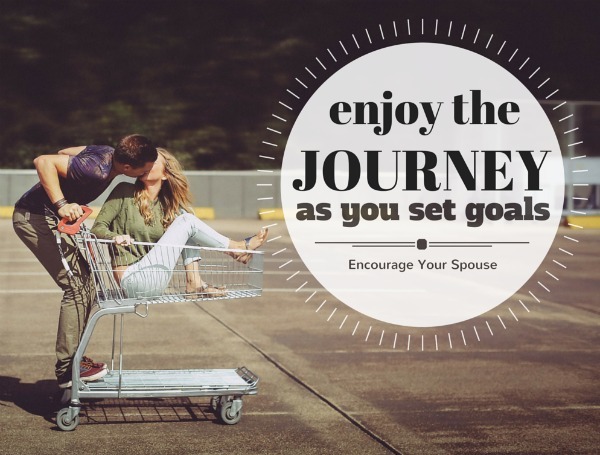 If you and your spouse approach goal setting with the right attitude, you might be surprised at the type and significance of the goals you set. You’ll also more likely enjoy the journey, as you go through the various stages of life. What other ways have you found work in your marriage when setting goals? Robert Ferguson is a speaker, writer and consultant with a passion for values. He and Lori are on an adventure – touring North America with their F150 and fifth wheel. Read more about Robert on the “About Us” page. Leave a comment and win a copy of this book! The Barney’s will be sending a copy of their 48 Hour Relationship Retreat to one of the readers of Encourage Your Spouse who leaves a comment! You can enter more than once by leaving a comment on any of the posts in this series on goalsetting! At the end of of Feburary, Lori will use Random.org to draw a name from all the comments and the Barneys will mail a signed copy to the winner! Just Comment below to Enter! All the possibilities in life… need a plan —> or they won’t happen. It’s easy to let “real life” meander – or dash – or fast forward, and find your dreams sinking into the muck of “wish I coulda” because time has passed too fast, and too far. Maybe it’s laziness, maybe it’s fear, maybe it’s something else – but the days, weeks and years can pass without us even noticing. And realize time has moved – and it is too late. Some of us will never dance the lead in Swan Lake, or know the intense concentration needed in a twelve-hour neurosurgery, or the chaos and joy from adopting siblings from Russia, or the physical exhaustion and exhilaration from hiking to Machu Pichu at 8000 feet above sea level. But there will be other dreams. Other plans. Other goals. 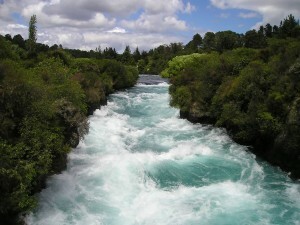 Shake off your fear – address the comfort that isn’t serving you! When are you going to put a plan together to make sure those dreams, plans and goals won’t disappear also? What kinds of possibilities could you plan for? In which area do you begin your plan? but always start by going to the Creator of Heaven and Earth and first inquire of Him . Encouraging your spouse in prayer. 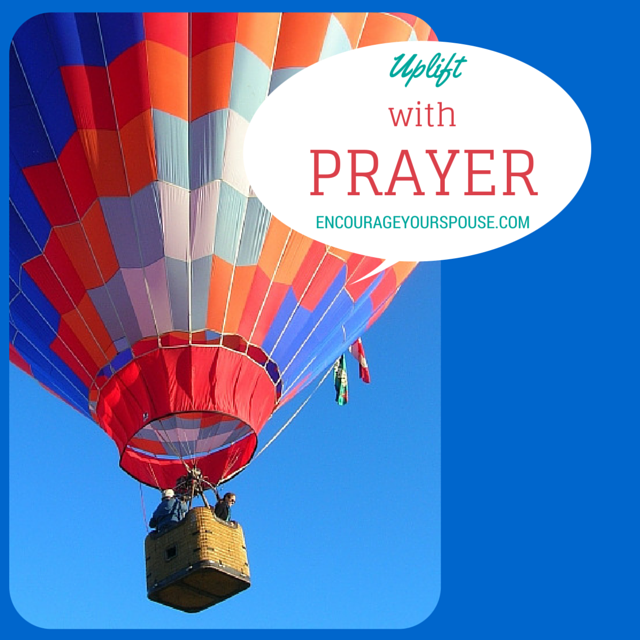 Prayer is an action – it’s like going up in a hot-air balloon together – lifting up your spouse. 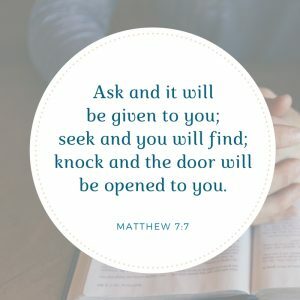 Ask the One who knows the future – and has plans for you! 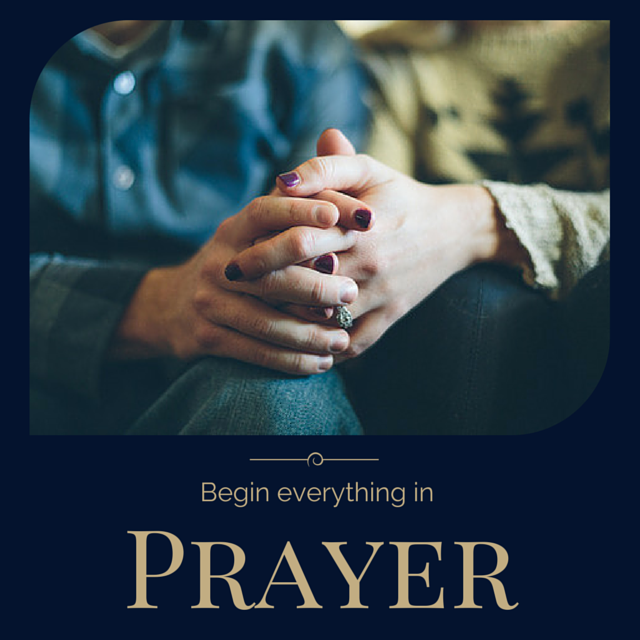 Have you considered that prayer is a part of setting goals? In which areas will you begin to pray? 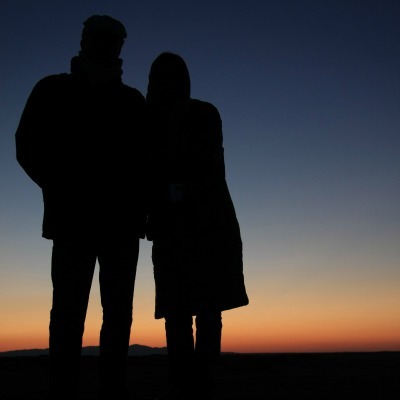 Maybe your spouse is already praying about an area… do you know? Encouragement doesn’t happen in a vacuum – maybe your spouse needs something to encourage you about – pray together to understand which direction the Lord wants you to take. Leave a comment – and be entered to win a book that’ll walk you through a retreat to talk about setting goals. 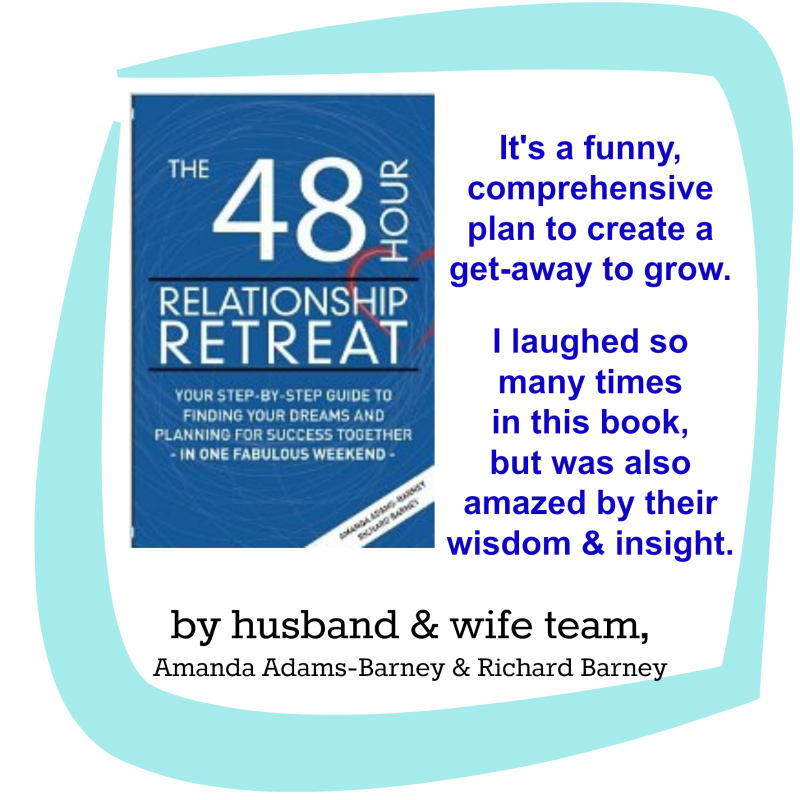 It’s a 48-Hour Relationship Retreat book by Amanda Adams-Barney and Richard Barney. In each of the posts about goalsetting, if you leave a comment, you’ll be entered to win. At the end of February I’ll use Random.org to choose a winner and the Barneys will send that winner a signed copy of their book. Start your plans with prayer.